Love them or loathe them, the Ewoks became a big part of the lore of the Star Wars universe, both during and after the original movie trilogy. Now this October comes a brand-new full-color trade paperback from Dark Horse Press, looking to tie up some loose ends. “Until now, the Ewoks had been able to ignore the arrival of the Empire’s stormtroopers on Endor. 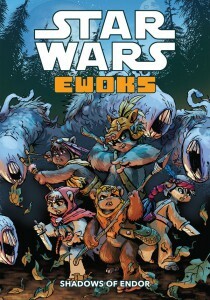 But when they discover their rivals, the Duloks, have been enslaved and a legendary beast has been awakened, the Ewoks realize they may have to prepare for war—as soon as they figure out how to survive the beast!” Written and illustrated by Zack Giallongo (with art help by Braden Lamb), Star Wars: Ewoks — Shadows of Endor links up events and characters from the Ewoks animated TV series with the events in Return of the Jedi. I have to ask; was anyone really asking for the story of how the characters from the Ewoks show connect with Return of the Jedi?